At Haz-ed we firmly believe the best way to avoid accidents in the workplace is to prevent them from happening in the first place. No matter what type of business you run, there is an appropriate safety system for your workplace. We can help you navigate the options and apply the appropriate fitting safety system that works efficiently in your workplace. unauthorised access is prevented on scaffolding that is incomplete and left unattended (for example, by attaching danger tags and warning signs at appropriate locations). Light duty suspended scaffolding incorporates a suspended platform that is capable of being raised or lowered when in use. Are a good option if you require a flexible safety option that can be used on both hard and rough terrain surfaces. It includes include scissor lifts, cherry pickers, boom lifts and travel towers. This involves hoists and a working platform that can both raise workers or materials to temporary working position. They can be set up as a single or multi configuration. This safety device works in conjunction with a crane, hoist, forklift truck or other mechanical device. It’s designed to create space where employees can work from an elevated area. A building maintenance unit is a suspended working platform that is fixed permanently to a building or structure. This is a great option for building maintenance or window cleaning. This system is suitable for light tasks, such as painting and rendering. If used at heights greater than two metres, it’s recommended that guard rails and toe boards are incorporated to prevent people and material falling off the platform. The minimum width of the working platform should not be less than 450 milimeters. This safety solution can be added to the edges of roofs, mezzanine floors, stairways, ramps and landings. It’s advised they incorporate a top rail of 900 to 1100 millimeters above the working surface and a mid-rail and a toe board. At Haz-ed we recommend before using a guard rail system you should check it will be adequate for your potential loads. A securely fixed mesh offers great protection for roof installers and employees doing long term maintenance and repair work. At Haz-ed we recommend using the safety mesh with appropriate edge protection, guard rails or fall arrest systems. A work positioning system enables a person to work supported in a harness in tension. At Haz-ed we recommend the following safety systems are undertaken when using this equipment. Employees should have a high level of competency and be trained accordingly when using this equipment. barricades and signposts to be placed on all access areas below the working area and anchorage locations to exclude and alert the public and tradespeople. This controls a person’s movement by physically preventing the person reaching a position at which there is a risk of a fall. A harness is connected by a lanyard to an anchorage or horizontal life line. This technique is enables the user to maintain secure footing without having to tension the restraint line and without the aid of any other hand hold or lateral support. incorporate a fully planked-out deck, one that extends at least two meters beyond all unprotected edges of the work area. Position the deck as close as possible to the underside of the work area. Always be used with an adequate form of edge protection. store nets correctly in dry, shaded areas with good air circulation. Individual fall-arrest systems rely on workers using or wearing them correctly. At Haz-ed we recommend this system only be used where it is not reasonably practicable to use higher level control measures. It’s a must for all workers to be trained before they use this system. 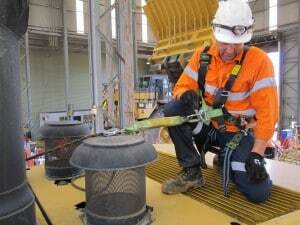 Relevant Australian/New Zealand Standards for personal fall-arrest equipment require that they be permanently marked or labelled to indicate their purpose, correct use, limitations and other relevant information aimed at reducing misuse of the equipment. Anchorages, lifelines, inertia reel, lanyard of fixed length, retractable lifelines, rope grabs, wire grabs, rail system, shock absorbers, both personal and industrial, harness, snap hooks (double or triple action to prevent rollout), karabiners (double or triple action to prevent rollout) and rescue equipment.